The Ministry of Corporate Affairs (MCA) deals with the administration of companies in India. 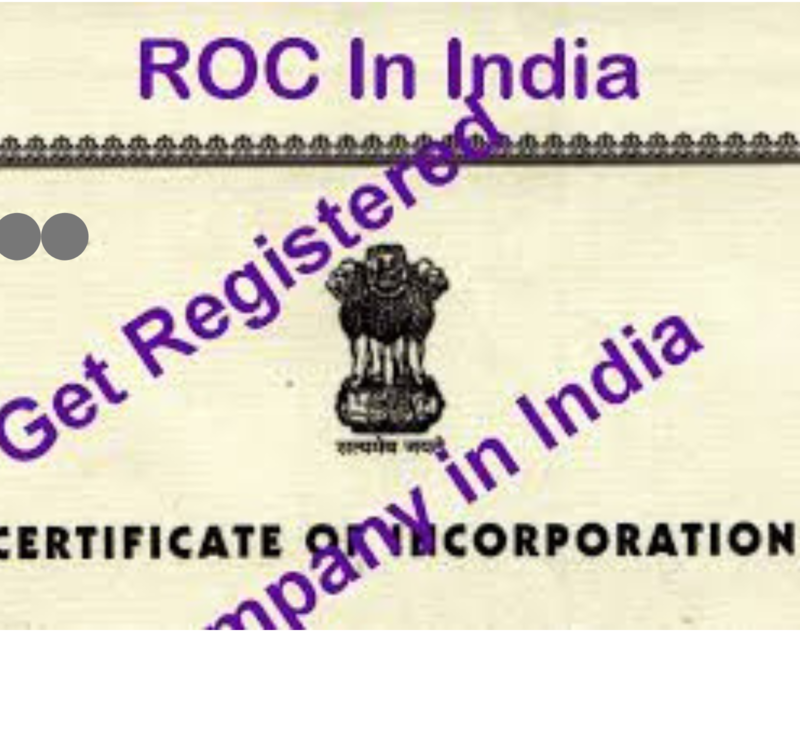 The Registrar of Companies (ROC), comes under the MCA. The ROC, of a State/Union Territories, has the primary duty of registering companies and Limited Liability Partnership (LLP) floated in their respective States/UT, as per Section 609 of the Companies Act, 1956. The purpose was to ensure that all companies are compliant with the statutory requirements of the Companies Act, 1956. Or the Companies Act 2013, in case of LLPs. The Central Government has administrative control over these offices through Regional Directors. ROC also controls new Company Registration, any renewals or changes in the existing ones. It maintains all records related to all the companies registered with them. The general public can pay a stipulated fee and check Registered Company Details. Company Registration requirements: A company is formed under Section 3 of the Companies Act by filing an application with the ROC of the respective state. Company Incorporation: Subsequently, if all requirements have been met with, the ROC may provide you with Incorporation Certificate, which is the definitive proof of the existence of your organization. Discontinuation: A company cannot just close down its operations and cease to exist. Due papers for Corporate Insolvency need to be filed with the Registrar of Companies, certifying the decision to terminate the business. Winding Up: The ROC can also file a petition for winding up of a company. Details of a Company: It organizes details about the companies, its directors and those holding its Share certificate. Keeping checks: The Registrar of Companies can ask for supplementary information from any company. With prior approval of the court, it can conduct a search on its premises, and/or seize its accounts. Reporting with the Government: It reports and directs the Central Government with several issues, such as updates required in various reports, documents, Annual Return Filing, etc. Refusal to Register a company: No company with unlawful objectives or objectionable name can be registered. Post Registration: You’ll have to intimate the Registrar of Companies in case you want to bring any changes or updates in the company structure. For example, changes in the Registered Office of Company, director’s appointments, Changing Name of a Company, expansion, etc. Business Culture: The ROC plays an essential part in promoting a culture of high transparency in the company’s operations. Stamped Copy of Memorandum of Articles (MOA), and a spare copy. It needs to be stamped with the required value of Revenue Stamps. Under the Subscription Clause of the MoA, the shareholders need to write his full name and father’s/husband’s full name in block letters, full address, post/occupation, etc. And the total number of equity shares taken, under column “Total number of equity shares”. Then put his or her signatures in the signature column, mentioning Date & Place. Articles Of Association (AoA), duly stamped copy and a spare photocopy. In the AoA, the subscriber is to write his full name and father’s/husband’s full name in block letters, full address, post/occupation. The signatures in the MoA & AoA are to be witnessed by one person, preferably the person who is representing these shareholders, for registration of the proposed company before the Registrar of Companies. Original copy of the letter from the ROC confirming the availability of an appropriate Company Name, by the filing of either Reserve Unique Name (RUN) Form or SPICe Form. Form #18, mentioning the Address of the registered office of the proposed company. Form #29 or the Director’s consent. Dates on the Consent Form and the Undertaking Letter must match with the MoA signed by the director himself. This is applicable in case of a Public Company. Form #32 with Particulars of the Proposed Directors, Manager or secretary. Power of Attorney printed on a Non-Judicial Stamp Paper of value, as applicable. The Stamp Paper must be purchased in the name of the persons who would be signing the authority. Any agreements, that the company plans to enter with any individual for appointment as managing or manager are to be filed. No Objection Certificate, signed by those persons whose name has been given in the Application for RUN Form or SPICe Form. In the event, they don’t want to maintain their association with the company. Fees as Applicable can be paid in cash, Bank Draft or Pay Order. The Draft/Pay Order has to be drawn in the name of the Registrar of Companies of the particular State in which you are seeking your Company Registration. Once the documents have been duly filed, the ROC registers the company’s name in the register of companies. The company would receive a Certificate of Incorporation. Along with this, the Registrar also issues a Certificate of Commencement of Business. A Public Limited Company needs to get this certificate before commencing business. Provisions Section 117 of the Companies Act state that every Resolution, taken at the Board Meeting is required to be filed with the ROC within 30 days of being passed. The Registrar of Companies has to record all the resolutions. Failure to do so, within the stipulated time, would result in a penalty. In other words, a company is required to communicate the ROC with all activities, including the appointment of directors/managing directors/sole-selling agents/agents, issuing prospectus, and the resolution of voluntary winding up, etc. Many people may wonder as to why the Registrar of Companies has to keep such information? A registered company is considered as an artificial legal person, in India. It has an independent & separate legal entity, with its seal for its signatures, capital comprising of shares. Any company carries limited liability and certain other attributes. It has a perpetual existence which is independent of its members and promoters. The ROC is responsible for what a company does. A company cannot take up activities that have not been stated in the Objects Clause of its MOA. This information is significant for a company’s current and prospective stakeholders. Legally, all stakeholders are supposed to know about its business, the board of directors, registered office, capital, liability, directors, powers of directors, etc. If the responsible person doesn’t file the information, within due time, with the ROC, then that person would be considered liable. The company won’t be held responsible for any unauthorised acts of its directors or members. Wish to set up your own business and company? Don’t stress over it and let our experts guide you through hassle-free Company Registration. Our huge team of skilled professionals will help you get private company registration, Nidhi company registration, LLP registration or OPC registration. Call us at +91 8750008585 or mail at contact@companyregistrationonline.in. You can also visit Companyregistrationonline. to get an overview of our company.